There are several asters that work well in the shade. Two are the White Woodland Aster (Eurybia divaricata fna Aster divaricalus) and the Large-leaved Aster (Eurybiai macrophylia fna Aster Macrophyllus). Both work well as groundcovers. White Wood Aster (Eurybia divaricata) has a somewhat zigzag dark green to almost black stem. 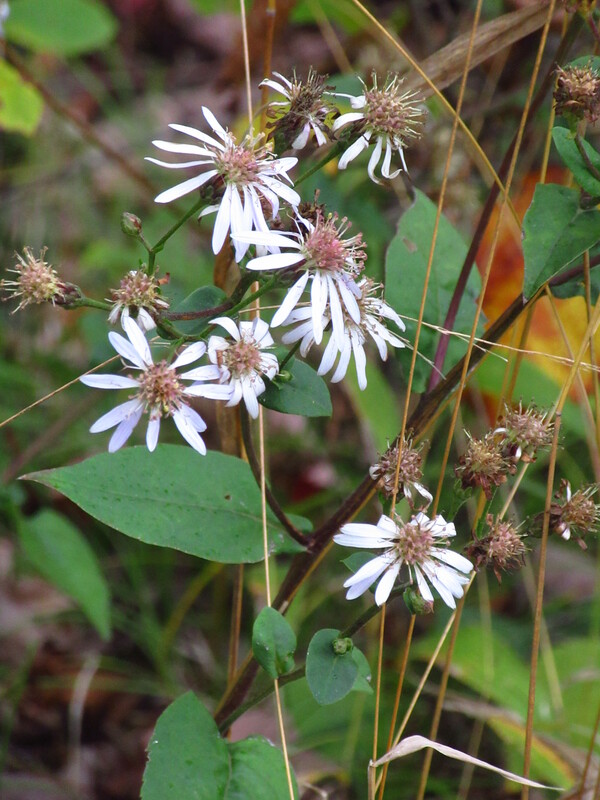 Native to Northeastern USA, White Woodland Aster blossoms late in summer and into the fall, providing nectar and pollen to late season insects. Its heart-shaped leaves with deeply toothed edges grow along a dark green, slightly zigzag stem that often looks black. Typical to the asters, its corollas are initially yellow, and later become purplish red. Its white blossoms are more star-shaped, with far fewer petals, than some of the sun-loving asters. It prefers dry open woods and edges of deciduous forests, but does well in wet mesic conditions. Large-leaved Aster (Eurybiai macrophylia) also has a slight zigzag stem but it tends more toward dark purple. Native to the Eastern and Midwestern USA, Large Leaf Aster also blossoms late in summer and into the fall, providing nectar and pollen to late season insects. 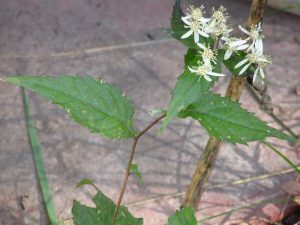 Its oval leaves with sawtooth edges grow along an almost black stem. Typical to the asters, its corollas are initially yellow, and later become purplish. Its lavender to white blossoms are also star-shaped, with far fewer petals, than some of the sun-loving asters. It prefers wet mesic woods and edges of deciduous forests, but is tolerant of almost any soil. Both asters are a great seed source for songbirds and for providing nesting material for birds.